Coltea – the oldest clinic of Bucharest to be demolished? The local authorities of the Romanian capital, Bucharest, are planning to demolish one of the oldest buildings of the city, which serves as a major clinic. Coltea Clinic was built in 1860 in a beautiful French renaissance style at the initiative of Carol Davila, a leading figure of the Romanian medicine. According to the local authorities, the spacious traditional hospital building is to be replaced by a multi-storey modernist building. The decision of the local authorities has angered both the medical staff of the Coltea Clinic and a number of civic groups which work to restore and promote the identity of Bucharest. Opponents of the demolition say that the building is part of the heritage of the city and it should be listed and fully protected. Coltea Clinic played an important role by saving many lives during the so-called Romanian revolution of 1989, being located within a few minutes walk from the University square, where many people were killed or injured. The Revolution In December 1989 led to the collapse of the communist system in Romania. A number of civic groups of Bucharest have attended a demonstration in Bucharest against the demolition of the building, on 12 November 2006. They accuse the local authorities of being “corrupt” and utterly insensitive towards the heritage of the city. In reply, the major of the 3rd sector, Liviu Negoita, says that a firm decision has to be taken in order to modernise Romanian hospitals, arguing that protest demonstrations may push away investors from Romania. Civic groups have asked the local authorities to open a public debate and listen to the views of the inhabitants of Bucharest. They say that the mayor refuses to talk to people on this matter and is determined to sign the demolition decision within a matter of days. 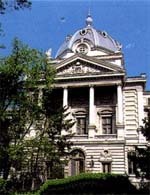 Civic groups have opened a petion online at www.romanianews.net against the demolition of the traditional building. The petition has been signed so far by thousand of people. The Romanian capital, Bucharest was known before the Second World War as “little Paris”. Most of its architecture was under French influence and the urban planning of the city followed to some extent the Parisian model, with large boulevards and straight lines. A small number of buildings survived the war and the communist regime. Communist leaders had ordered the demolition of large number of traditional buildings and started to built the now infamous blocks of flats. Most of the neighbourhoods of Bucharest are now formed of those blocks, which often look rather bleak. Within this background a number of civic groups have started to campaign in favour of restoring and preserving whatever is left of the architecture heritage of Bucharest.